Consumer electronics are some of the most popular gift choices for the holidays, but imagining the heaps of packaging material that result from millions of people unboxing their shiny new laptops, iPads and PS3s ain't a pretty picture. While we hope for electronics companies to lessen the amount of packaging they use, one man is turning some of it into amazing works of eco art. Jason Rogenes takes regular old styrofoam - the kind that you might find when you open up a new printer - and transforms it into these futuristic displays that look like something from the background of a Star Wars movie. Rogenes uses all different shapes and sizes of polystyrene packing material to build his creations which range from smaller pieces to giant, death-ray like ones. He also uses light to really play up the interaction between the varied forms, making them look like intricate parts of a spaceship. While it might be a tall order to create something of the same magnitude as some of these works youself, it’s definitely inspiration to start saving that styrofoam and put together a smaller installation for your own living room! 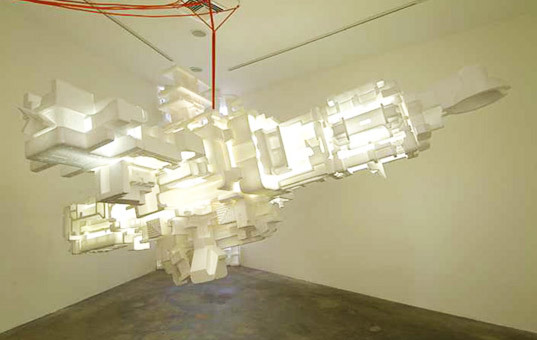 Very innovative use of styrofoam, never thought of it as a decorative lighting option. My only bit of criticism is that the cords are very distracting to the aesthetic. ...to giant, death-ray like ones. He also uses light to really play up the interaction between the varied forms, making them look like intricate parts of a spaceship. 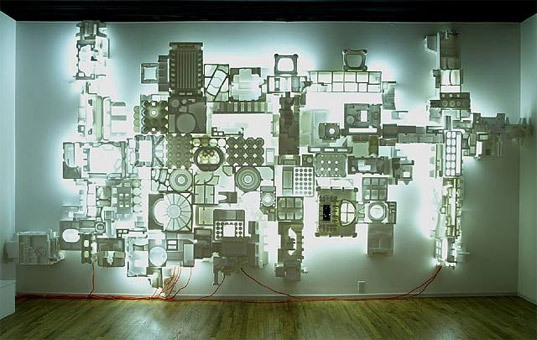 While it might be a tall order to create something of the same magnitude as some of these works youself, it's definitely inspiration to start saving that styrofoam and put together a smaller installation for your own living room! This piece, called "Tanspondor" is made of found polystyrene, fluorescent lights, 2 transformer boxes, electrical cables and fishing line. A smaller piece that you might be able to emulate at home!